Believe it or not, as far as I can remember, I’ve never made Breakfast Cookies. So when I saw this recipe on Pinterest, I knew I had to try it. And I was super happy with how my tweaked version turned out. They are delicious, healthy, and filling! Recipe adapted slightly from Sally’s Baking Addiction. 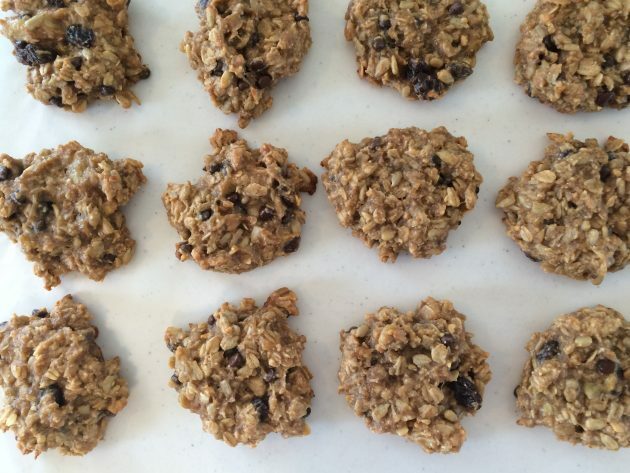 Have you ever made Breakfast Cookies? What do you put in yours? I love to add flax seed and some soy protein powder. I will try the recipe above and change it up a little . Thank you for all the great posts. Could you be a little more specific than “chemical?” I’m interested. 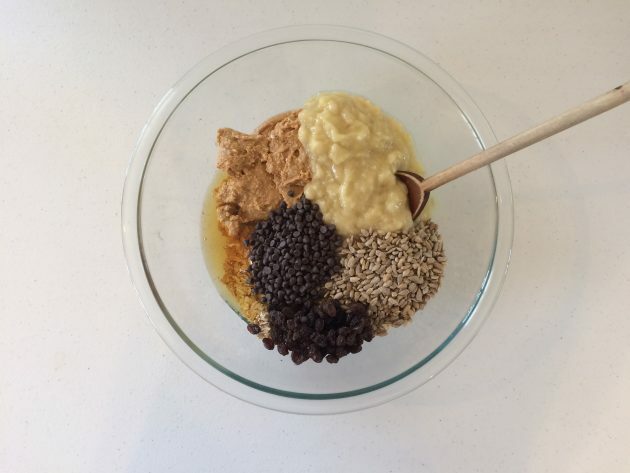 Research shows that you can safely bake with flax seeds. 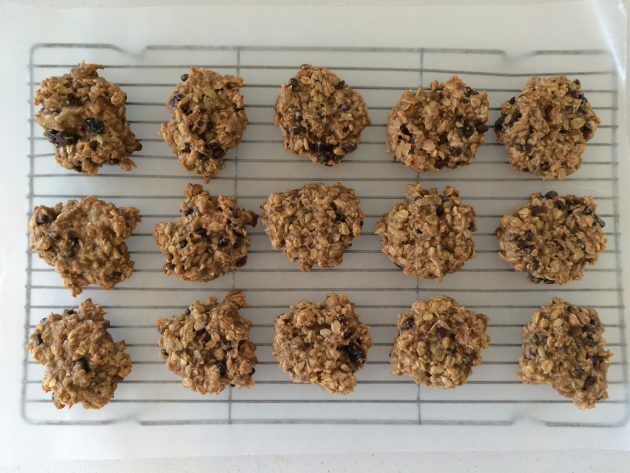 I make breakfast cookies often, our current favorite version contains bran and whole wheat flour with a handful of chocolate chips and dried cranberries. I made the recipe up by combining 2 different ones I found online since I too didn’t have all the ingredients either recipe called for. so … did you chop up your whole oats or leave them as is?? I often use my organic thick rolled oats….?? I was wondering the same thing. From the picture, it looks like maybe she didn’t chop them…? Apple butter is hard to come by where I live does anyone know something cheep and available I can use as substitute? The original recipe calls for apple butter, but this recipe above does not (I added in an extra mashed banana instead). I see that now, thank you, Crystal. If you have apple sauce, you can add cinnamon and cloves and cook in the slow cooker until thick and then can it. You could add homemade applesauce in place of the apple butter. Or as mentioned in another comment you can add more banana. 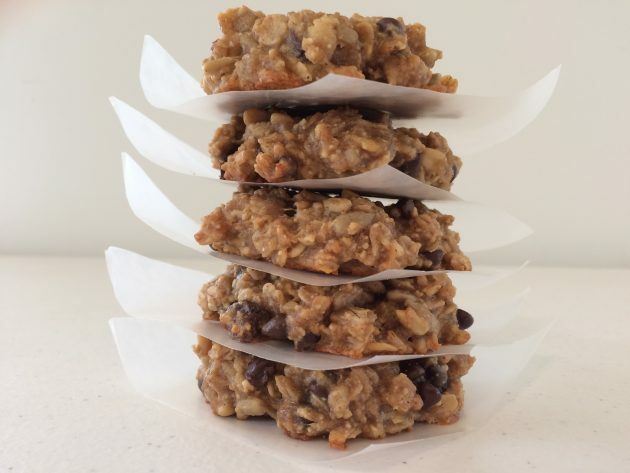 I have made this recipe with both whole and ground oats and honestly like a combination of both since whole oats make the cookies fall apart a little too much. Very good recipe if you are trying to watch your sweets. Our favorite breakfast cookies actually have cheese and bacon in them. We are eating the left overs this morning. It may be at the top of our list for all time favorite breakfasts! Could we have that recipe please? Sounds great! I am looking for quick protein for my kids. These might do the trick! These look amazing! I’m always looking for something to make in advance for breakfast so we don’t just end up with cereal on hurried mornings. I’ll have to give this a try. Thanks! So is there any substitute for honey? I have molasses and breakfast syrup. I think you could try breakfast syrup. I wouldn’t suggest molasses as that would probably give them a weird taste. What could I use instead of bananas? My son is highly allergic to them. You could try pureed pumpkin or apple butter. I used a cup of applesauce instead of the bananas, and they were delicious! Hi – Thank you for posting this I made them and they turned out great! I have a question though.. Can this dough be frozen? or refrigerated for a couple of days prior to baking? Possibly — I’ve not tried it. Let us know if you do! I want to make these tomorrow. Do you use raw or roasted sunflower seeds? Oddly, my kids did not like these but my husband and I loved them. I froze them in individual snack bags and found that they are great for right after the gym when you are starving. Very filling! I throw a frozen one in my gym bag in the morning and they are perfect by the time I come out. Do these have a banana flavor to them? Yes they do. I love them, but my son and husband won’t eat them–they say they are too banana-y for them. Made these and they are wonderful! My husband wanted more cinnamon and more banana in them, they also turned out great. Does anyone have the nutrition info on these. I need to know how many carbs there are and how much protein if possible. Thanks. These cookies are not that great. I did not care for them and neither did my kids. The texture is sticky and VERY dense and the flavor was a little bland. I am excited to try these! I’m not a huge breakfast person, but do find that I ma famished by 10:00. I’m a school teacher so these will be great to pop in my bag for late morning snack or even afternoon pick me up. I did not have bananas so I used frozen raspberries. Crossing my fingers. It’s a start. Didn’t care for the cinnamon with the milk chocolate and cranberries. That whole thing didn’t blend well with me. I ate one warm, so maybe after they sit over night in the fridge, they’ll taste different. Going to try making it more like a cookie and do a chocolate chip walnut or an oatmeal raisin. perhaps you could try dark chocolate chips? Is there something you could use to substitute the peanut butter out with other than another type of nut butter? My husband is allergic to nuts; thankfully not a really bad allergy, but it does make him uncomfortable. I would love to be able to make these, but don’t know if they would be the same if the peanut butter is removed all together. Same goes with no-bake chewy granola bars. Thanks in advance! I’ve made these with store bought sunflower butter for my nut-allergic kids. It works as well as peanut butter. 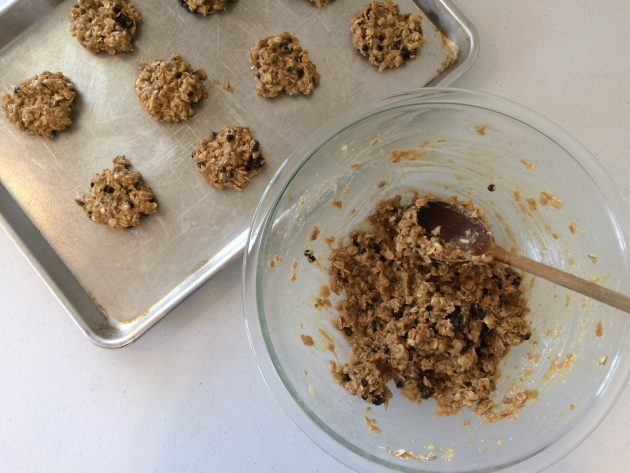 I also use sunbutter in no bake energy bites with oats, raisins, and a little honey. Just combine ingredients until mixture is a little sticky and roll into balls about the size of a Ping pong. Store in the fridge. My kids gobble them up like candy! Thank you so much! I would of never thought to use sunflower butter. I use part sunflower seed butter and part peanut butter. You could easily use all sunbutter, or try pumpkin seed butter. Oh my yummy breakfast goodness! I am so pinning these and making them soon! 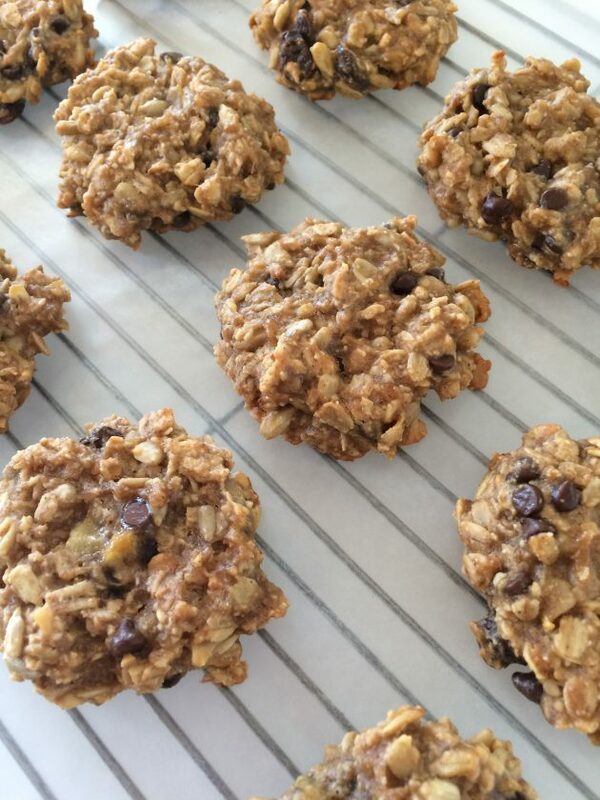 You can’t go wrong with cookies for breakfast! What is the nutritional information for this recipe, please? My husband is allergic to bananas. Can you reccommend a substitute? You could try apples and/or applesauce. wondering if these would even need to be baked? sounds to me like refrigerating them would be all you would need to do? sound great though – will be trying this week! These look so good! My kids would love cookies for breakfast and I wouldn’t feel guilty giving this to them. Yum! We make a similar version, but with chocolate chips. 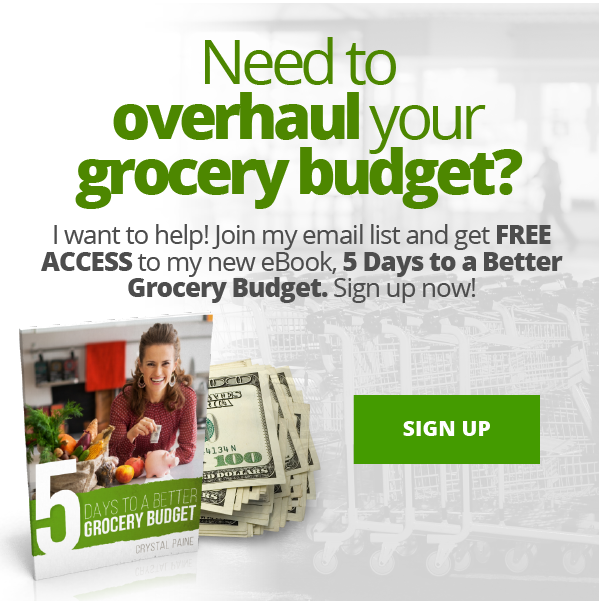 Your Pinterest graphic looks awesome too! These cookies are delicious! Just baked a batched with 1/2 cup chocolate chips, and I subbed walnut pieces for the raisins. They’re so good and would be great with a cup of coffee in the morning. Love that they’re dairy and egg free too!